Tonopah Test Range. Sounding rocket and test vehicle launch site. Conducted launches in support of US nuclear weapons development programs. AKA: TTR. First Launch: 1957-01-01. Last Launch: 1988-09-28. Number: 117 . Location: Nevada. Longitude: -116.78 deg. Latitude: 37.80 deg. Family: Suborbital Launch Site, Tomahawk Sandia. Country: USA. Launch Vehicles: Nike, Asp, Doorknob 2, Doorknob 1, Nike Apache, HJ, Deacon Arrow II, Asp II, Kisha Judi, Hopi Dart, Tomahawk, Nike Tomahawk, Terrier Tomahawk, Sandhawk, Tater, Terrier Nike, Pedro Recruit, Malemute. 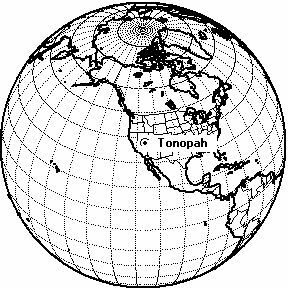 Launch Sites: Tonopah HAD4, Tonopah UL3. Agency: Sandia. Bibliography: 2. 1957 - . Launch Site: Tonopah. LV Family: Lacrosse. Launch Vehicle: Doorknob. Test mission - . Nation: USA. Agency: Sandia. Apogee: 84 km (52 mi). 1957 April 1 - . Launch Site: Tonopah. LV Family: Lacrosse. Launch Vehicle: Doorknob. Test 17 (last research and development) mission - . Nation: USA. Agency: Sandia. 1957 June 1 - . Launch Site: Tonopah. Launch Vehicle: Asp. 1957 July 27 - . Launch Site: Tonopah. LV Family: Lacrosse. Launch Vehicle: Doorknob. Test mission - . Nation: USA. Agency: Sandia. Apogee: 24 km (14 mi). 1958 November 19 - . 20:32 GMT - . Launch Site: Tonopah. LV Family: Deacon. Launch Vehicle: Deacon Arrow II. RW-104 Aeronomy mission - . Nation: USA. Agency: Sandia. Apogee: 78 km (48 mi). 1958 November 20 - . 02:25 GMT - . Launch Site: Tonopah. LV Family: Deacon. Launch Vehicle: Deacon Arrow II. RW-105 Aeronomy mission - . Nation: USA. Agency: Sandia. Apogee: 76 km (47 mi). 1958 November 20 - . 08:18 GMT - . Launch Site: Tonopah. LV Family: Deacon. Launch Vehicle: Deacon Arrow II. RW-106 Aeronomy mission - . Nation: USA. Agency: Sandia. Apogee: 83 km (51 mi). 1958 November 20 - . 14:10 GMT - . Launch Site: Tonopah. LV Family: Deacon. Launch Vehicle: Deacon Arrow II. RW-107 Aeronomy mission - . Nation: USA. Agency: Sandia. Apogee: 84 km (52 mi). 1958 December 15 - . 21:37 GMT - . Launch Site: Tonopah. LV Family: Deacon. Launch Vehicle: Deacon Arrow II. RW-108 Aeronomy mission - . Nation: USA. Agency: Sandia. Apogee: 80 km (49 mi). 1958 December 16 - . 03:25 GMT - . Launch Site: Tonopah. LV Family: Deacon. Launch Vehicle: Deacon Arrow II. RW-109 Aeronomy mission - . Nation: USA. Agency: Sandia. Apogee: 83 km (51 mi). 1958 December 16 - . 08:49 GMT - . Launch Site: Tonopah. LV Family: Deacon. Launch Vehicle: Deacon Arrow II. RW-110 Aeronomy mission - . Nation: USA. Agency: Sandia. Apogee: 83 km (51 mi). 1958 December 16 - . 14:47 GMT - . Launch Site: Tonopah. LV Family: Deacon. Launch Vehicle: Deacon Arrow II. RW-111 Aeronomy mission - . Nation: USA. Agency: Sandia. Apogee: 84 km (52 mi). 1959 - . Launch Site: Tonopah. LV Family: Asp. Launch Vehicle: Asp II. Cleansweep I test - . Nation: USA. Agency: Livermore. Apogee: 30 km (18 mi). 1959 January 27 - . 20:35 GMT - . Launch Site: Tonopah. LV Family: Deacon. Launch Vehicle: Deacon Arrow II. RW-112 Aeronomy mission - . Nation: USA. Agency: Sandia. Apogee: 83 km (51 mi). 1959 January 28 - . 07:28 GMT - . Launch Site: Tonopah. LV Family: Deacon. Launch Vehicle: Deacon Arrow II. RW-114 Aeronomy mission - . Nation: USA. Agency: Sandia. Apogee: 82 km (50 mi). 1959 January 31 - . Launch Site: Tonopah. LV Family: Lacrosse. Launch Vehicle: Doorknob. Aeronomy mission - . Nation: USA. Agency: Sandia. Apogee: 24 km (14 mi). 1959 March 12 - . 18:45 GMT - . Launch Site: Tonopah. LV Family: Deacon. Launch Vehicle: Deacon Arrow II. RW-118 Aeronomy mission - . Nation: USA. Agency: Sandia. Apogee: 85 km (52 mi). 1959 March 13 - . 00:38 GMT - . Launch Site: Tonopah. LV Family: Deacon. Launch Vehicle: Deacon Arrow II. RW-119 Aeronomy mission - . Nation: USA. Agency: Sandia. Apogee: 84 km (52 mi). 1959 March 13 - . 07:30 GMT - . Launch Site: Tonopah. LV Family: Deacon. Launch Vehicle: Deacon Arrow II. RW-120 Aeronomy mission - . Nation: USA. Agency: Sandia. Apogee: 69 km (42 mi). 1959 March 13 - . 12:30 GMT - . Launch Site: Tonopah. LV Family: Deacon. Launch Vehicle: Deacon Arrow II. RW-121 Aeronomy mission - . Nation: USA. Agency: Sandia. Apogee: 83 km (51 mi). 1959 April 16 - . 11:09 GMT - . Launch Site: Tonopah. LV Family: Deacon. Launch Vehicle: Deacon Arrow II. RW-122 Aeronomy mission - . Nation: USA. Agency: Sandia. Apogee: 66 km (41 mi). 1959 April 16 - . 17:00 GMT - . Launch Site: Tonopah. LV Family: Deacon. Launch Vehicle: Deacon Arrow II. RW-123 Aeronomy mission - . Nation: USA. Agency: Sandia. Apogee: 79 km (49 mi). 1959 April 16 - . 23:10 GMT - . Launch Site: Tonopah. LV Family: Deacon. Launch Vehicle: Deacon Arrow II. RW-124 Aeronomy mission - . Nation: USA. Agency: Sandia. Apogee: 83 km (51 mi). 1959 April 17 - . 05:00 GMT - . Launch Site: Tonopah. LV Family: Deacon. Launch Vehicle: Deacon Arrow II. RW-125 Aeronomy mission - . Nation: USA. Agency: Sandia. Apogee: 82 km (50 mi). 1959 May 5 - . 08:55 GMT - . Launch Site: Tonopah. LV Family: Deacon. Launch Vehicle: Deacon Arrow II. RW-126 Aeronomy mission - . Nation: USA. Agency: Sandia. Apogee: 81 km (50 mi). 1959 May 5 - . 23:20 GMT - . Launch Site: Tonopah. LV Family: Deacon. Launch Vehicle: Deacon Arrow II. RW-127 Aeronomy mission - . Nation: USA. Agency: Sandia. Apogee: 82 km (50 mi). 1959 June 17 - . 17:00 GMT - . Launch Site: Tonopah. LV Family: Deacon. Launch Vehicle: Deacon Arrow II. RW-128 Aeronomy mission - . Nation: USA. Agency: Sandia. Apogee: 81 km (50 mi). 1959 June 18 - . 01:00 GMT - . Launch Site: Tonopah. LV Family: Deacon. Launch Vehicle: Deacon Arrow II. RW-129 Aeronomy mission - . Nation: USA. Agency: Sandia. Apogee: 81 km (50 mi). 1959 June 18 - . 07:32 GMT - . Launch Site: Tonopah. LV Family: Deacon. Launch Vehicle: Deacon Arrow II. RW-130 Aeronomy mission - . Nation: USA. Agency: Sandia. Apogee: 80 km (49 mi). 1959 June 18 - . 13:00 GMT - . Launch Site: Tonopah. LV Family: Deacon. Launch Vehicle: Deacon Arrow II. RW-131 Aeronomy mission - . Nation: USA. Agency: Sandia. Apogee: 82 km (50 mi). 1959 July 14 - . 21:00 GMT - . Launch Site: Tonopah. LV Family: Deacon. Launch Vehicle: Deacon Arrow II. RW-132 Aeronomy mission - . Nation: USA. Agency: Sandia. Apogee: 76 km (47 mi). 1959 July 15 - . 09:15 GMT - . Launch Site: Tonopah. LV Family: Deacon. Launch Vehicle: Deacon Arrow II. RW-134 Aeronomy mission - . Nation: USA. Agency: Sandia. Apogee: 81 km (50 mi). 1959 July 15 - . 15:13 GMT - . Launch Site: Tonopah. LV Family: Deacon. Launch Vehicle: Deacon Arrow II. RW-135 Aeronomy mission - . Nation: USA. Agency: Sandia. Apogee: 83 km (51 mi). 1959 July 15 - . 15:34 GMT - . Launch Site: Tonopah. LV Family: Deacon. Launch Vehicle: Deacon Arrow II. RW-133 Aeronomy mission - . Nation: USA. Agency: Sandia. Apogee: 78 km (48 mi). 1959 August 26 - . 13:58 GMT - . Launch Site: Tonopah. LV Family: Deacon. Launch Vehicle: Deacon Arrow II. RW-137 Aeronomy mission - . Nation: USA. Agency: Sandia. Apogee: 81 km (50 mi). 1959 August 26 - . 19:35 GMT - . Launch Site: Tonopah. LV Family: Deacon. Launch Vehicle: Deacon Arrow II. RW-138 Aeronomy mission - . Nation: USA. Agency: Sandia. Apogee: 79 km (49 mi). 1959 August 27 - . 02:00 GMT - . Launch Site: Tonopah. LV Family: Deacon. Launch Vehicle: Deacon Arrow II. RW-139 Aeronomy mission - . Nation: USA. Agency: Sandia. Apogee: 80 km (49 mi). 1959 August 27 - . 06:42 GMT - . Launch Site: Tonopah. LV Family: Deacon. Launch Vehicle: Deacon Arrow II. RW-140 Aeronomy mission - . Nation: USA. Agency: Sandia. Apogee: 80 km (49 mi). 1959 September 26 - . 07:00 GMT - . Launch Site: Tonopah. LV Family: Deacon. Launch Vehicle: Deacon Arrow II. RW-141 Aeronomy mission - . Nation: USA. Agency: Sandia. Apogee: 72 km (44 mi). 1959 September 26 - . 13:00 GMT - . Launch Site: Tonopah. LV Family: Deacon. Launch Vehicle: Deacon Arrow II. RW-143 Aeronomy mission - . Nation: USA. Agency: Sandia. Apogee: 77 km (47 mi). 1959 September 26 - . 20:45 GMT - . Launch Site: Tonopah. LV Family: Deacon. Launch Vehicle: Deacon Arrow II. RW-144 Aeronomy mission - . Nation: USA. Agency: Sandia. Apogee: 71 km (44 mi). 1959 November 4 - . 01:23 GMT - . Launch Site: Tonopah. LV Family: Deacon. Launch Vehicle: Deacon Arrow II. RW-146 Aeronomy mission - . Nation: USA. Agency: Sandia. Apogee: 78 km (48 mi). 1959 November 5 - . 01:10 GMT - . Launch Site: Tonopah. LV Family: Deacon. Launch Vehicle: Deacon Arrow II. RW-147 Aeronomy mission - . Nation: USA. Agency: Sandia. Apogee: 84 km (52 mi). 1959 November 6 - . 01:13 GMT - . Launch Site: Tonopah. LV Family: Deacon. Launch Vehicle: Deacon Arrow II. RW-148 Aeronomy mission - . Nation: USA. Agency: Sandia. Apogee: 83 km (51 mi). 1960 - . Launch Site: Tonopah. LV Family: Viper. Launch Vehicle: Viper-Arrow. Nation: USA. Apogee: 100 km (60 mi). 1961 January 1 - . Launch Site: Tonopah. LV Family: Deacon. Launch Vehicle: Kisha Judi. Test mission - . Nation: USA. Agency: Sandia. Apogee: 100 km (60 mi). 1961 Feb - . Launch Site: Tonopah. LV Family: Viper. Launch Vehicle: Viper-Arrow. 1963 January 23 - . Launch Site: Tonopah. LV Family: Deacon. Launch Vehicle: Deacon Arrow II. Tracking Flare test - . Nation: USA. Agency: Sandia. Apogee: 90 km (55 mi). 1963 June 12 - . Launch Site: Tonopah. Launch Vehicle: Tomahawk. Seagull (IQSY) test - . Nation: USA. Agency: Sandia. Apogee: 105 km (65 mi). Seagull (IQSY). Technology test of NASA version..
1963 October 29 - . Launch Site: Tonopah. LV Family: Hopi. Launch Vehicle: Hopi Dart. Aeronomy mission - . Nation: USA. Agency: NASA Huntsville. Apogee: 90 km (55 mi). 1964 March 10 - . Launch Site: Tonopah. Launch Vehicle: Tomahawk. Tomahawk-Dart 7" Test / aeronomy mission - . Nation: USA. Agency: Sandia. Apogee: 105 km (65 mi). 1964 August 25 - . 00:30 GMT - . Launch Site: Tonopah. LV Family: Tomahawk. Launch Vehicle: Terrier Tomahawk. TT-12 no igniter test - . Nation: USA. Agency: Sandia. Apogee: 30 km (18 mi). 1964 October 20 - . Launch Site: Tonopah. Launch Vehicle: Tomahawk. FAILURE: Failure. Ballistic Test / aeronomy mission - . Nation: USA. Agency: Sandia. Apogee: 0 km (0 mi). 1965 - . Launch Site: Tonopah. Launch Vehicle: Tomahawk. Dart/Parachute - . Nation: USA. Apogee: 90 km (55 mi). 1965 - . Launch Site: Tonopah. LV Family: Deacon. Launch Vehicle: Nike Cajun. Dart/Parachute - . Nation: USA. Apogee: 2.00 km (1.20 mi). 1965 January 20 - . Launch Site: Tonopah. Launch Vehicle: Tomahawk. Magnus Stovepipe Test / aeronomy mission - . Nation: USA. Agency: Sandia. Apogee: 106 km (65 mi). 1965 February 2 - . Launch Site: Tonopah. Launch Vehicle: Tomahawk. Magnus Test / aeronomy mission - . Nation: USA. Agency: Sandia. Apogee: 106 km (65 mi). 1965 February 3 - . Launch Site: Tonopah. Launch Vehicle: Tomahawk. 1966 - . Launch Site: Tonopah. Launch Vehicle: Tomahawk. 1966 April 5 - . Launch Site: Tonopah. Launch Vehicle: Tomahawk. FAILURE: Failure. Despin test - . Nation: USA. Agency: Sandia. Apogee: 0 km (0 mi). 1966 April 21 - . 02:10 GMT - . Launch Site: Tonopah. LV Family: Deacon. Launch Vehicle: Nike Apache. Sandia 154-75 Aeronomy mission - . Nation: USA. Agency: Sandia. Apogee: 160 km (90 mi). 1966 August 10 - . Launch Site: Tonopah. Launch Vehicle: Sandhawk. FAILURE: Failure. 1966 September 15 - . Launch Site: Tonopah. Launch Vehicle: Sandhawk. FAILURE: Failure. 1967 - . Launch Site: Tonopah. Launch Vehicle: Tomahawk. 1967 January 17 - . Launch Site: Tonopah. Launch Vehicle: Sandhawk. Test / aeronomy mission - . Nation: USA. Agency: Sandia. Apogee: 188 km (116 mi). 1967 July 27 - . Launch Site: Tonopah. Launch Vehicle: Tomahawk. 9" Ballistic Ionosphere mission - . Nation: USA. Agency: Sandia. Apogee: 99 km (61 mi). 1967 September 7 - . 20:34 GMT - . Launch Site: Tonopah. LV Family: Tomahawk. Launch Vehicle: Nike Tomahawk. LRL BOX-8a X-ray astronomy mission - . Nation: USA. Agency: Sandia. Apogee: 187 km (116 mi). 1967 December 6 - . 15:41 GMT - . Launch Site: Tonopah. Launch Complex: Tonopah HAD4. Launch Vehicle: Tomahawk. LRL BOX-13 X-ray astronomy mission - . Nation: USA. Agency: Sandia. Apogee: 120 km (70 mi). 1968 August 23 - . 04:48 GMT - . Launch Site: Tonopah. Launch Vehicle: Sandhawk. LRL AXE-2 X-ray astronomy mission - . Nation: USA. Agency: Sandia. Apogee: 187 km (116 mi). 1969 September 11 - . 23:44 GMT - . Launch Site: Tonopah. Launch Complex: Tonopah HAD4. LV Family: Tomahawk. Launch Vehicle: Nike Tomahawk. LRL RCS-3 (Daisy III) Aeronomy mission - . Nation: USA. Agency: Sandia. Apogee: 165 km (102 mi). 1969 November 18 - . 21:32 GMT - . Launch Site: Tonopah. LV Family: Tomahawk. Launch Vehicle: Nike Tomahawk. LRL ACS-5 Solar x-ray mission - . Nation: USA. Agency: Sandia. Apogee: 174 km (108 mi). 1970 January 13 - . 05:32 GMT - . Launch Site: Tonopah. LV Family: Tomahawk. Launch Vehicle: Nike Tomahawk. LRL ROX-3 X-ray astronomy mission - . Nation: USA. Agency: Sandia. Apogee: 180 km (110 mi). 1972 June 2 - . 06:16 GMT - . Launch Site: Tonopah. Launch Complex: Tonopah HAD4. LV Family: Tomahawk. Launch Vehicle: Nike Tomahawk. LRL ACS-1C X-ray astronomy mission - . Nation: USA. Agency: Sandia. Apogee: 175 km (108 mi). 1973 August 15 - . Launch Site: Tonopah. LV Family: Talos. Launch Vehicle: Tater. Test mission - . Nation: USA. Agency: Sandia. Apogee: 5.00 km (3.10 mi). The Talos-Terrier-Recruit (TATER) launch vehicle was successfully test launched at the Tonopah Test Range. .
1974 - . Launch Site: Tonopah. LV Family: Terrier. Launch Vehicle: Terrier Nike. Parachute test - . Nation: USA. Agency: Sandia. Apogee: 2.00 km (1.20 mi). 1974 May 7 - . Launch Site: Tonopah. LV Family: Talos. Launch Vehicle: Tater. Nation: USA. Agency: SAND. Apogee: 4.00 km (2.40 mi). 1975 June 4 - . Launch Site: Tonopah. Launch Vehicle: Honest John. 1975 August 27 - . Launch Site: Tonopah. Launch Vehicle: Honest John. 1975 September 3 - . 10:30 GMT - . Launch Site: Tonopah. LV Family: Tomahawk. Launch Vehicle: Nike Tomahawk. LRL ACS-1D X-ray astronomy mission - . Nation: USA. Agency: Sandia. Apogee: 270 km (160 mi). 1975 September 23 - . 10:02 GMT - . Launch Site: Tonopah. LV Family: Tomahawk. Launch Vehicle: Nike Tomahawk. LRL ACS-1E X-ray astronomy mission - . Nation: USA. Agency: Sandia. Apogee: 270 km (160 mi). 1976 January 14 - . Launch Site: Tonopah. LV Family: Talos. Launch Vehicle: Tater. SAMS/TATER 602 - . Nation: USA. Apogee: 4.00 km (2.40 mi). 1976 March 27 - . Launch Site: Tonopah. LV Family: Talos. Launch Vehicle: Tater. SAMS/TATER 516 - . Nation: USA. Apogee: 4.00 km (2.40 mi). 1976 April 25 - . Launch Site: Tonopah. LV Family: Talos. Launch Vehicle: Tater. SAMS/TATER 512 - . Nation: USA. Apogee: 4.00 km (2.40 mi). 1978 May 6 - . Launch Site: Tonopah. LV Family: Tomahawk. Launch Vehicle: Nike Tomahawk. DNA Avefria Uno - . Nation: USA. Apogee: 192 km (119 mi). 1978 May 20 - . Launch Site: Tonopah. LV Family: Tomahawk. Launch Vehicle: Nike Tomahawk. DNA Avefria Dos - . Nation: USA. Apogee: 192 km (119 mi). 1979 April 19 - . Launch Site: Tonopah. Launch Vehicle: Malemute. Malemute II test - . Nation: USA. Agency: Sandia. Apogee: 165 km (102 mi). 1984 December 1 - . Launch Site: Tonopah. Launch Vehicle: Honest John. Stores parachute 1 test - . Nation: USA. Agency: Sandia. Apogee: 12 km (7 mi). 1985 - . Launch Site: Tonopah. Launch Vehicle: Honest John. Stores parachute 2 test - . Nation: USA. Agency: Sandia. Apogee: 12 km (7 mi). 1986 April 1 - . Launch Site: Tonopah. Launch Vehicle: Honest John. Stores parachute 10 test - . Nation: USA. Agency: Sandia. Apogee: 12 km (7 mi). 1988 September 28 - . Launch Site: Tonopah. Launch Vehicle: Genie. RSP-101/Genie - . Nation: USA. Agency: SAND. Apogee: 10 km (6 mi).